Our first night in Kelowna, we were treated to a divine meal at Summerhill's Sunset Organic Bistro (clockwise from top right): bubbly in Brut and Rosé; quinoa-crusted chèvre w garden-fresh veggies; balsamic-drizzled seared scallops w grilled strawberry and boar pancetta (OMG scallops+strawberries = foodgazm); a frozen grape from last year's harvest in lilac cordial sparkling water; elk medallions w blue cheese and yam gnocchi; BC wild salmon w quail's egg and sea beans. Dessert (far right): chocolate gelato icewine float and raspberry dark chocolate sacher cake. Breakfast on day two of the pre-conference excursion was served up by Chef Mark Filatow (of Details Catering) at Tantalus Vineyards. Poached egg on potato rosti (pronounced RUSH-tee) w white pepper gravy; Belgian waffles w strawberries, blackberry compote & Arlo's Honey-infused crème fraiche (another OMG foodgazm right there.) 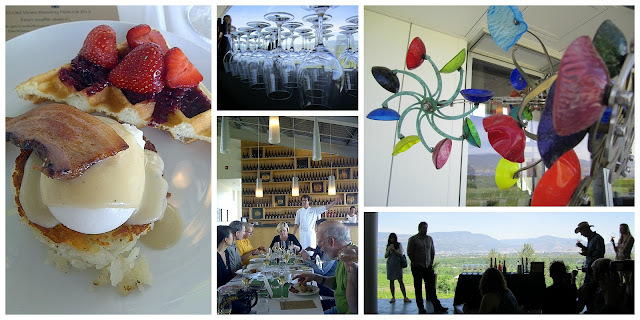 More gorgeous views of Okanagan Lake from the Tantalus open-air tasting room (bottom right); and the funkiest wind chime/weather vane/cool glass thingy ever (top right). Hands-down, though, the most exquisite, delicious, and delightfully hosted meal was at Tinhorn Creek's Miradoro. 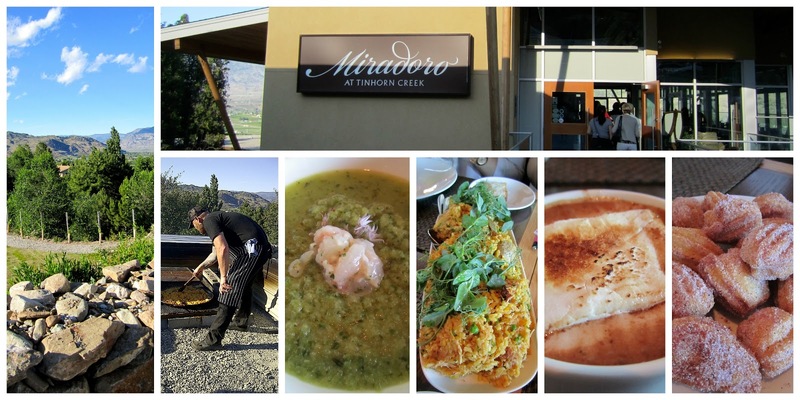 Sandra Oldfield had her chefs serve up a simple yet elegant parade of dishes: cucumber gazpacho w spot prawn garnish; paella (note the 52" paella pan tended by head chef Jeff in the glorious outdoors); chili-infused hot chocolate w homemade marshmallows; blackberry-sugar-dusted churros.